I almost forgot to post this... 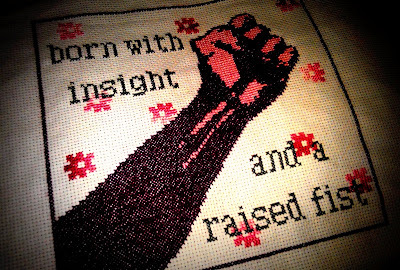 It is a birthday gift for the smartest four month old baby I know, quoting my teenage heros in Rage Against the Machine. The first time I saw them play live was at an old gymnasium in a suburb north of Stockholm, back in 1996. I was fifteen, going on sixteen, & got totally blown away by their performance. I still think that the debut album is so awesome, that I'm prepared to forgive them for the fact that this is the band that probably played the biggest role in creating the monstrosity what later would be known as funk metal. Fun anecdote: When RATM played at the Hultsfred festival in 2000, rumor has it that the Seismic Institute at Uppsala University recorded a small earth quake in southern Sweden.